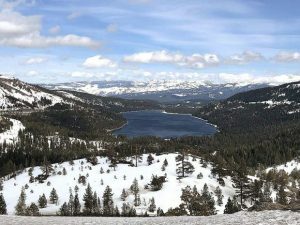 With 16 scenic vista points planned, the Incline-to-Sand Harbor bike path aims to be "one of the most spectacular bike paths in all the United States," Tim Cashman, president of the Tahoe Fund board of directors, said previously. 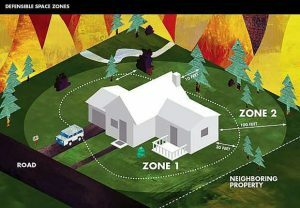 INCLINE VILLAGE, Nev. — The long-awaited bike path from Incline Village to Sand Harbor State Park is on course to break ground this upcoming construction season — roughly a year later than originally anticipated. The “East Shore Bike Trail” will consist of a 10-foot-wide, three-mile paved path separate from Highway 28, providing safe access along a dangerous stretch of roadway that often features motorists dodging cyclists and pedestrians. While trail work is anticipated to start this construction season, which typically extends from May 1 and Oct. 15, the specific month it will begin is yet to be determined, he said. It’s expected the three-mile paved trail will take two seasons to construct, Hasty said. 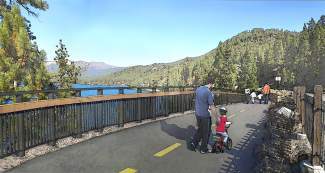 The multi-use trail will start at the Lakeshore Drive intersection, expanding that road’s current bike path down to Sand Harbor, providing access to Hidden Beach, Memorial Point and other scenic vistas along the way. It’s estimated the project, which also includes erosion control work along Highway 28 and additional parking spaces along the route, will cost between $26 million and $27 million, Hasty said. Project funding is secured and consists of a mix of private, local, state and federal dollars, he said. With construction slated for this year, it marks the next major component in the Tahoe Transportation District-led America’s Most Beautiful Bikeway project that aims to one day circumnavigate the lake. Meanwhile, another phase of the project extending from Sand Harbor to the U.S. Highway 50, Spooner Summit junction is being developed, with environmental analysis being performed, Hasty said. Securing approvals and funding for that 8-mile trail segment are among the next steps. “(Trails) are becoming a more important part of our overall transportation network,” Hasty said. Visit tahoetransportation.org/sr28 to learn about this and other projects planned for Highway 28 between Incline Village and Spooner.